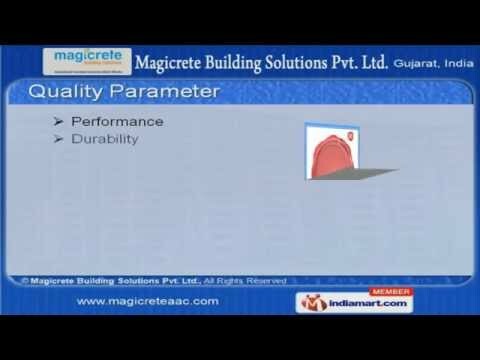 Welcome to Magicrete Building Solutions Private Limited, building solutionsManufacturer & Supplier of Autoclaved Aerated ConcreteThe company was established in 2008, at Surat. Robust infrastructure unit, Cutting edgetechnology & Customer centric approach, help us to cater Indian Sub-continent & othercountries. Stringent quality tests, Affordable prices, defect free range & timeliness are the pillars of ourorganization. Procuring Agents, Engineers, Technicians & Quality Controller comprise our workforce. Performances, Easy Utilization & Rate of Cost are some of the quality parameters on which ourproducts are tested. Lodha Group, Indiabulls Real Estate & Ahluwalia Contracts (India) Limited are few of ourprestigious clients. Telephone, Fire Exit, Security Guards, Drinking Water & Boundary Walls are the facilitiesavailable with us. Our Autoclaved Aerated Concrete Blocks are unmatched in quality. Autoclaved Aerated Concrete Blocks offer high resistance to earthquakes.